For those of us who don’t have trust funds, Swiss bank accounts, sizable inheritances, or six-figure jobs, fashion isn’t just art; shopping is a science. The fact of the matter is, there are certain pieces of clothing that every woman should own, and unfortunately, it’s excruciatingly easy to determine when those articles are fake. If you’re headed to an important function, a job interview, or meeting your boyfriend or future in-law’s parents, it’s important to put your best foot forward… in authentic, comfortable shoes. Here’s what to look for when maintaining a budget is important. Fashion is important, but you can find comfortable shoes without breaking the bank. There are several items that should be a part of every woman’s wardrobe that should be high quality. Although they come with a price tag, the good news is that these wardrobe essentials are timeless, fitting for every age, and can be used as basics in almost any outfit. What’s the first item to invest in? Purchase a pair of genuine, quality pearls that land at the décolletage or top of the collar. It doesn’t matter if you’re the “preppy” type- you don’t have to pair them with a sheath dress, gloves, and kitten heels; pearls add class to any outfit. The second item to invest in is a “little black dress” or “LBD”. Choosing the right dress to buy can be tricky for many women. Ask yourself these questions: Will I wear this dress ten years from now? How about twenty? Does this dress flatter my body type? Is this dress appropriate all year round (i.e. will it look appropriate with tights in the winter, is the length appropriate, is the fabric high-quality)? If your answer to all of these questions is “yes”, you’ve found a winner. An outfit wouldn’t be complete without the right pair of shoes, and unfortunately, fashion, function, and comfort all come with a price. When splurging on shoes, forget about current trends completely and walk straight to the plain, closed-toe black leather pumps. Celebrities buy Christian Louboutins for more than the signature red sole: they’re actually comfortable. 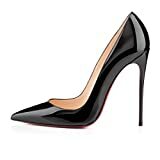 Even if you can’t afford the outrageously expensive Louboutins, look for a heel that genuine leather and no taller than 4 inches. On the subject of leather, always choose the real thing (unless you’re vegan)- particularly with handbags. Fake leather can be spotted from a mile away and besides, real leather is far more comfortable. Don’t give up on your hunt – a frugal shoe made out of leather will make itself known; you just have to do some high end hunting.